All of the devices, including lighting, music, curtains, the bed headboard, minibar, TV and other audiovisual equipment, will connect through Google Home voice assistant and also be accessible via an in-room tablet. Different hotel brands are implementing different strategies and different technologies to bring to life the guestroom of the future. Marriott, for example, has reportedly partnered with Legrand and Samsung to create a “smart room” wherein all devices respond to voice activation. Meanwhile, Hilton is developing a smart room that will rely on the guests’ own smartphones to connect with different devices in the room in a unified manner. Now Paris-based hospitality giant AccorHotels, which owns and operates nearly 4,000 hotels globally under such brands as Grand Mercure, Novotel, Swissôtel Hotels and Resorts, Sofitel, Raffles Hotels & Resorts and Fairmont Hotels and Resorts, has unveiled its own ambitious plans for a smart room. According to reports, AccorHotels is partnering with multiple solution providers to develop the technology that will power the room. All of the devices, including lighting, music, curtains, the bed headboard, minibar, TV and other audiovisual equipment, will connect through Google Home voice assistant and also be accessible via an in-room tablet. Among the futuristic features are an LED motion-sensing lighting system foot board motion sensor that will automatically turn on and off and electronic sleep aids and relaxation systems, including Dodow, a device that promotes both concentration and sleep, and Dreem, a headband with integrated brain energy sensors and a relaxation system. Pre-set aromatherapy devices will allow guests to wake up to a certain aroma, like coffee, tea. Using Google Home voice assistant or the tablet, guests will be able to adjust lighting and music (via a Devialet Phantomspeaker), close curtains, tilt the guestroom bed’s headboard and control audiovisual equipment. The room will include a wardrobe with sliding shelves and rods for easy access to clothes. The bathroom will be equipped with an adjustable shower head, a folding and adjustable shower seat and a height-adjustable sink. AccorHotels has a rich history of technology innovation. A recent example is the introduction of Jaccede, a mobile app that allows guests to review the accessibility of different places, from restaurants and bars to stores and hotels. To date, Jaccede has accessibility reviews for more than 100,000 sites worldwide. 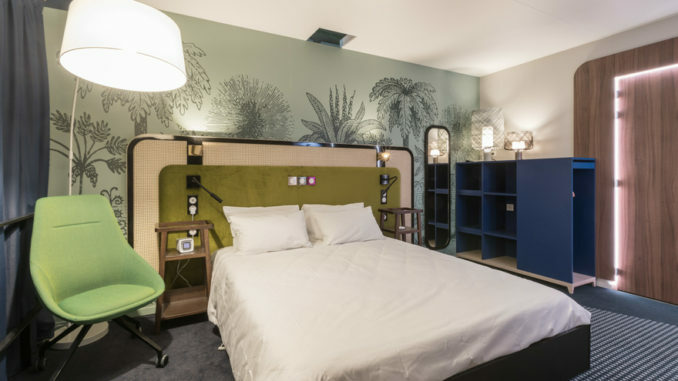 AccorHotels’ smart room concept is still in testing mode at the company’s headquarters in Paris. The company has not yet announced a timeline for when the smart phone will become available to guests.